CRACKLE ,SHATTER GLASS NEW YORK. Cracked, Crackle, Krackle or Shatter Top glass, whatever you may wish to call it, has a beautiful effect. 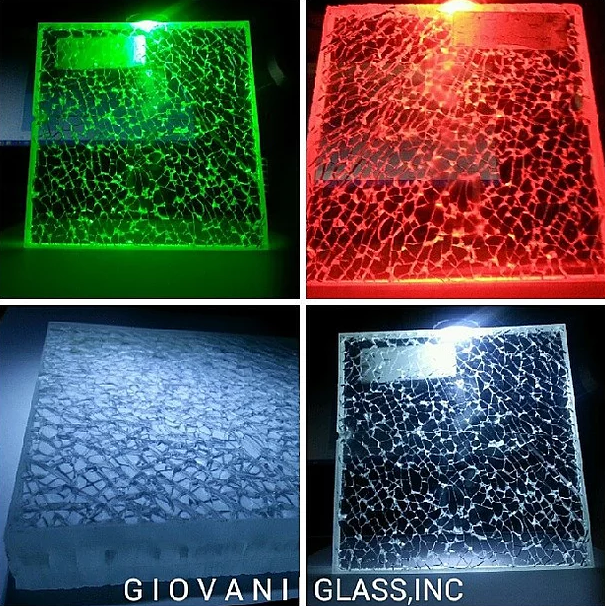 Our Crackle glass is made by laminating three pieces of 1/4” glass with the middle piece tempered and then broken. That is why Crackle glass is just over 3/4” thick. For an even more interesting look, low iron glass may be used. Please visit our website at www.bknyglass.com for our portfolio pictures. Blue Crackle Regular Clear Crackle Low Iron Crackle Crackle Glass Samples Bronze Crackle Low Iron Crackle laminated glass.